The service was impeccable and the dishes were wonderfully tasty. We are from New York City, are foodies & really enjoyed our meal at Maydanoz! Excellent quality dishes, generous servings & a delightful ambiance. Would go back without hesitation. Nice people, great food and good athmosphere! Excellent food! The mezze’s are the real thing! The food and the service was great. I also liked the turkish music accompanying the food. 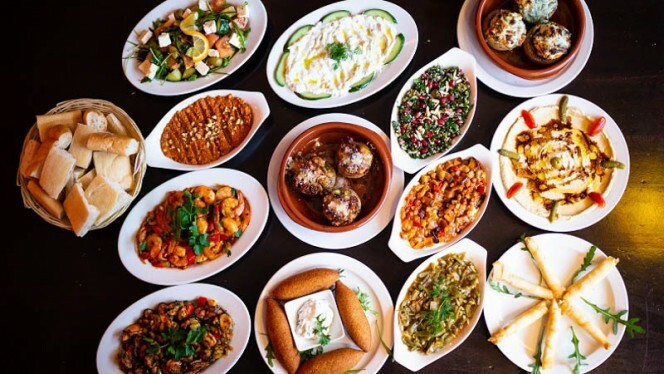 As a turkish person living in amsterdam for almost 3 years now I have tried many turkish restaurants and something was missing all the time. But at Maydanoz, the combination of food, music, atmosphere and friendly behavior of the staff was just perfect. / Hem mezeler, hem kebap güzeldi. Fonda çalan türk sanat müziği de gittiğim pek çok türk restoranında keşke olsa dediğim bir şeydi. Servis çok iyiydi, personel samimi ve güler yüzlüydü. Beklentimi yüksek tutmadan gittim ama çok memnun kaldım. Tekrar giderim. Food very good, apart from the ice cream with the baklava. Service very friendly but a bit slow also because the waiter was alone. Still it is a restaurant worth a visit if you are looking for a good Mediterranean cousine! Note: the olive oil was very nice! Nice food and very welcoming and friendly hosts. We came in soaking wet from the rain and soon forgot all about that, all worth the effort! Friendly staff and the food was excellent. Good service. A family member is vegetarian so nice to see a few options for them. Tremendous value for money. I had lamb kebab, and my husband had lamb chops. Both were delicious. We also had two appetizers - one with veal and hummus. Both outstanding. Delicious food! Service could be a little more attentive. The restaurant has a lovely thematic decoration that creates a nice mood for a couple to have dinner. The chairs could be a bit more comfortable though. Wow. The cold starter with Artichoke was good. But the mixed grill main course was one the best grill I ever had. The grilled dorade was also very good. So was the yogurt dessert. The service was warm and welcoming as well. The restaurant is gorgeous and the service is fantastic. The owners greet you and make you feel like a regular! Food is outstanding and ample and reasonably priced. Wine is also very good! Great food - very tasty and well presented. Service was friendly, but a bit slow and obsolete given that the restaurant was less than half full. The mixed mezzes are amazing. The service is fast and the waitresses are really kind. I would strongly recommend this place if you are into Turkish food. Very nice starter! The waitress recommended me to go for the lamb wrap served with the tomato and yogurt sauce (lots of meat!). No regret to follow her recommendation. Insiders have known it for quite some time: you come to Maydaanoz for lunch or dinner that you will not soon forget! Here you taste the Eastern part of the Meditteranean sea: Syria, Libanon, Israel, Greece and especially Turkey. Famous for their mezedes and their exquisit dishes from the woodfire grill, this is a wonderful place!